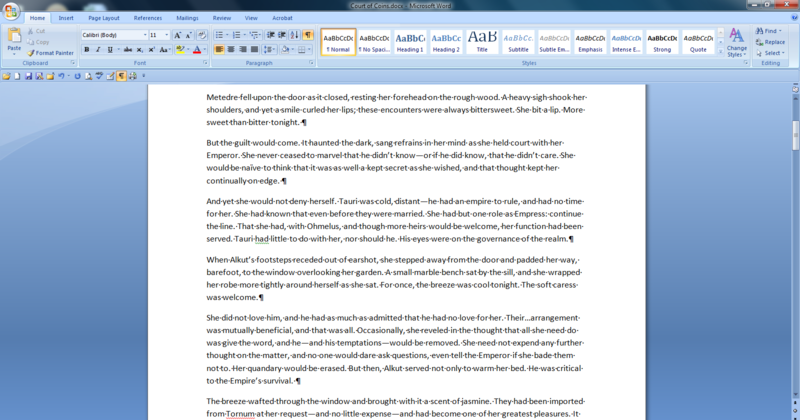 Today I want to give a quick tip about Scrivener. I’ve started following them on twitter (here), where they send tips and shortcuts. One that I’ve seen a couple times from them is how you can back up your work in the cloud by using Dropbox–which is a great idea. You can save it as a .zip file, and you’re good to go. Do this regularly. 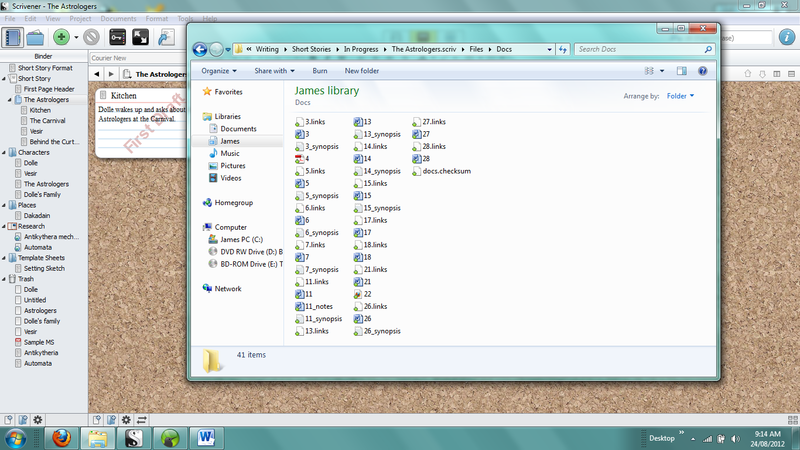 But I mostly don’t use Sugarsync for backup; I use it to synchronize my work between computers, so I can work anywhere. One of my first questions about Scrivener was if I could open a project on a different computer, work on it, and see that work updated when I got to my home machine. 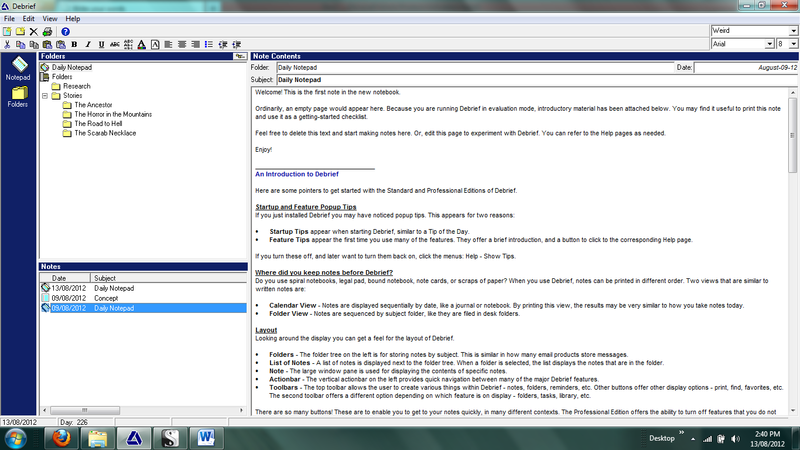 Of course, normally you can’t do this unless you have Scrivener on each machine–but I’ve found a way to make it work. 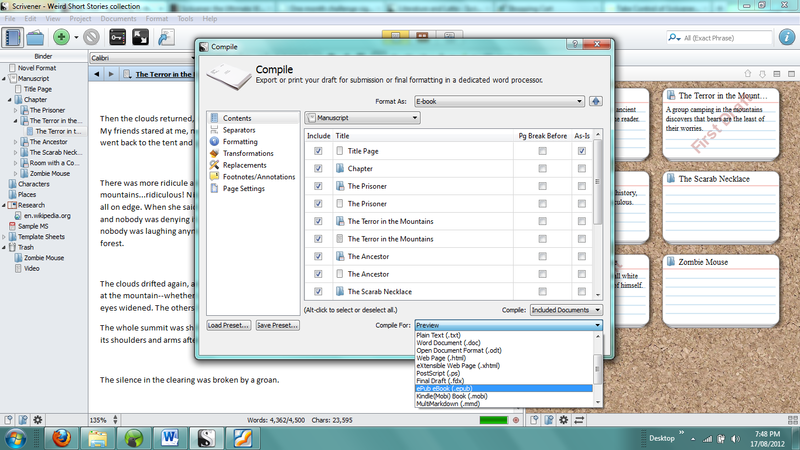 Scrivener saves each project in a series of .rtf files. If you go to Windows Explorer and open up the folder containing your project, you’ll see another folder called Docs. This folder contains all the information for your project, including the little blurbs on your index cards, how they’re linked together, and the actual text files for each chapter or scene. And here’s the trick: if you open one of those .rtf files on another computer through Sugarsync and make edits, those changes appear in Scrivener as soon as it updates in the cloud–and because Scrivener saves your project automatically, the reverse is true. So working on your Scrivener project on the go is as simple as finding the document you want to edit and going from there. There are two caveats: the first is the way the files are named. Scrivener names those files automatically–or, rather, numbers them. If you try to change the name of a file to something you’ll more easily recognize–for example, Scene 1–it will show up in your Scrivener project as blank, because the program is looking for particular file names. So there is some trial and error in finding the file you want to edit–but really, it’s as simple as opening up .rtf files until you find the one you want. After that, it’s smooth sailing, though it might be inconvenient for really large projects with dozens of files. Secondly, you won’t of course have access to all the wonderful options and tools of the program–you’re just editing a word file. If you have Scrivener on another computer, synchronizing should work even better, and you’d have full access to the project on both computers. 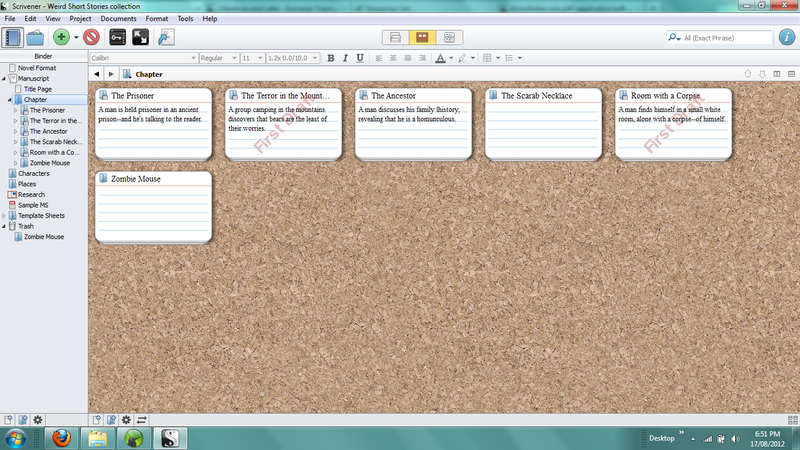 But this suits my purposes; when I write I like to just bang it out, and go over it later when I edit. 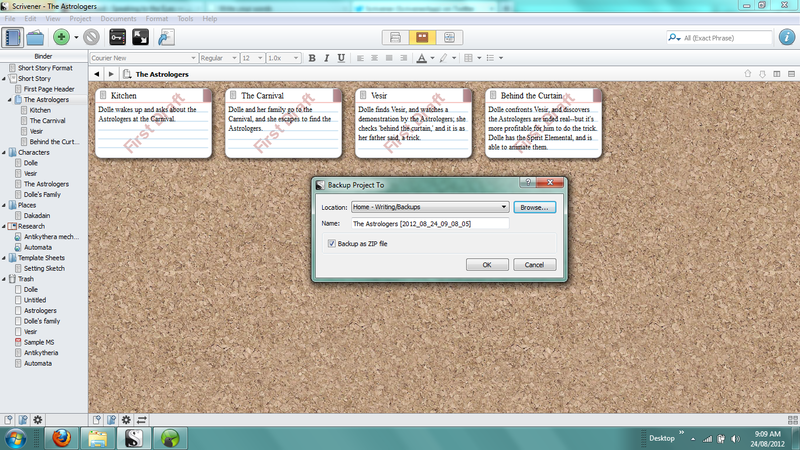 I can do the really rough draft on the go, and edit and play around with it in Scrivener when I’m on my main PC. So there you have it. It may not be for everyone, but I’ve found it tremendously useful! And although I’m not a Dropbox user, I imagine the whole process works in just the same way with that program. P.S. You can follow Sugarsync on Twitter as well, right here. I unfortunately wasn’t able to post yesterday–good argument for not promising to post daily, not enough time for that–but fortunately was planning a piece on some cloud based technology that will work well with today’s post: tools you can find online. Nowadays, the internet is ubiquitous. You have it on your phone; you can get information almost anywhere, at the touch of a button. With the increasing prevalence of wi-fi Hot Spots at restaurants, airports and coffee shops, you can even bring your laptop with you most places and plug in. Which makes writing on the go a lot easier. When I was in University, I had a Palm Pilot with a little fold out keyboard, and everything folded up into a neat wallet sized bundle. I did all my writing on this device–creative and schoolwork–and it was a godsend. But the one thing I always missed was that it was only a place to get my thoughts out; I couldn’t do any decent editing because the word processor wasn’t great; there was no dictionary or encyclopedia on the device; and research was no more convenient than bringing a notepad to the library and writing by hand. Then I got a laptop, and would bring that everywhere; I had a lot more at my fingertips, but still couldn’t connect to the internet for research, and the battery life wasn’t all that great. Today, your average phone has more processing power than my laptop did back then, and you have a plethora of tools available for you whenever you want them. In fact, information is so readily available that, interestingly, it’s holding us back; in his book The Shallows, Nicholas Carr posits that having so much information so easily available is causing us to only skim it for what we want right now, rather than digging deeper. But that’s a topic for another day. Dictionary.com and Thesaurus.com are a must. Of course, nothing beats having a real Webster’s, but for quick reference, it’s a lot better than the options in Microsoft Word. The thing I like most about these online resources is that entries are hyperlinked, so you can click your way from one definition to the next very quickly. It might seem like cheating, but it’s a quick way to double check the spelling of your word or find an alternative to fit the story. You can also check out popular quotes on a variety of subjects. Wikipedia is another invaluable “quickie” resource. Now let’s get this out of the way first: it’s an open to all platform, where anyone who signs up can edit an entry. This means you’ll find a lot of obscure information that won’t be in Encyclopedia Britannica–but more importantly that you can’t rely on the truth of the information you find. I use Wikipedia as a starting point, looking up a topic I think is interesting and exploring it from there. Each entry should include source material, and that’s where you’ll find the proper books to do some real research. It’s a great place to get the tip of the iceberg–but for real research, you’ll have to dig deeper. As a side note, there are wikis made for pretty well any subject you can imagine, some of which will have much more specific information that Wikipedia, so do your Googling. One of these separate wikis is TVTropes.com. It’s a compendium of various well used tropes and ideas from all media–the site is quick to point out the difference between a trope and a cliche. This is a place where you can look up, for example, character archetypes. Or your basic plots. 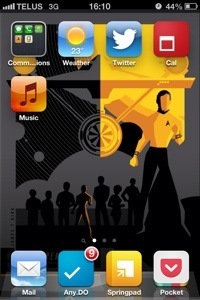 Or one of my favourite Sci-Fi devices, The Watson. This is the kind of site that’s worth just wandering around in. You’ll get lost for hours, but there’s so much to learn about the nature of entertainment, and how and why we enjoy it. Getting to know some popular tropes–and how to use them properly–can definitely make you a better writer. Speaking of becoming a better writer, you can’t go wrong with studying The Elements of Style. This is the seminal grammar text from Strunk and White, and is a must-read for any writer. That website (which includes the entire text), says it best on the front page: you have to know the rules before you can effectively break them. Grammar is important for a creative writer because you want to break it occasionally, whether it’s to fit the tone, alter a character’s dialogue, or create tension. But don’t do it blindly:here’s the road map. Another way to improve your writing is to get in touch with your audience. That means building a fan base, but also paying attention to what others are writing in the same genres as you. Goodreads is a site where you can review books you’ve read, and see how others are reviewing the same books. By browning through the stacks, as it were, you can see which authors are acclaimed for what they do–and put them on your reading list. With some careful consideration about what types of books people seem to most enjoy, you can start thinking about elements you want to bring into your own work. Now, I’m not saying you need to write for the masses–that’s not what creative writing should be about–but it’s also not wise to write something nobody wants to read in the first place. Almost any city, province, region or country is going to have a writer’s guild somewhere. Up here, we have the Writer’s Guild of Alberta. Any writer’s guild worth it’s salt is going to be a congregation of like minded–and geographically close to you–writers who can share their craft. You’ll find writing tips, editing services, constructive feedback, contest, and publishing information. If you haven’t already, find your nearest writer’s guild and sign up! One of my favourite online resources is Sugarsync. Cloud based storage is the Next Big Thing, and Sugarsync got in early enough that’s they’ve got a really solid business model and great software. 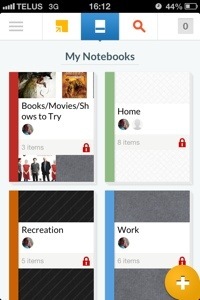 You can try Dropbox or iCloud or the new Google Drive; they’re all the same idea with different implementations. Now I admit that once I tried Sugarsync, I haven’t gone with anyone else–but that’s because I don’t need to. This program has everything I need–large storage space, easy access to the cloud, integration with Blackberry, and excellent customer service. There’s really no reason not to use them. I find Sugarsync to be invaluable, not only because all my writing is safely secured in the cloud, but also because I can edit my work anywhere. I’m the kind of person who gets ideas out of the blue, normally when I’m not at my home computer. Sugarsync allows me to open up a document and edit it from wherever I am, even if the computer I’m using doesn’t have the software and isn’t hooked up to my own cloud. I can just go to their site and edit from there, and it’s the same on every other computer as soon as it’s synchronized. And no, I’m not on their payroll. I just love this company. So there’s a bunch of links for you to try out. It’s by no means an exhaustive list–there are dozens of great resources out there for writers. Share yours in the comments! National Novel Writing Month is a website that encourages users to…well, write a novel in one month. Their term is from November 1 to 30, and they’ve got a strict set of rules to follow. The idea is to challenge yourself as a writer under these time constraints–and honestly, a month is a lot of time if you plan it well. Can you write a full novel in 30 days? I haven’t tried this out yet, but am considering signing up for this year’s trial. Hope to see all you other writers there! 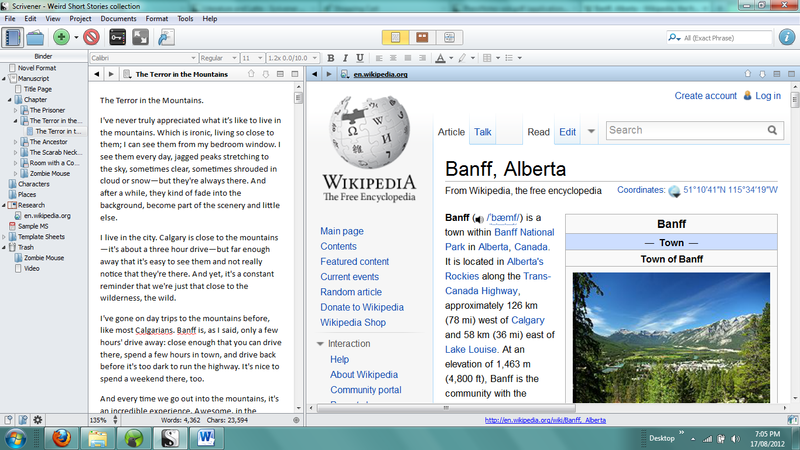 The main screen, where you write. 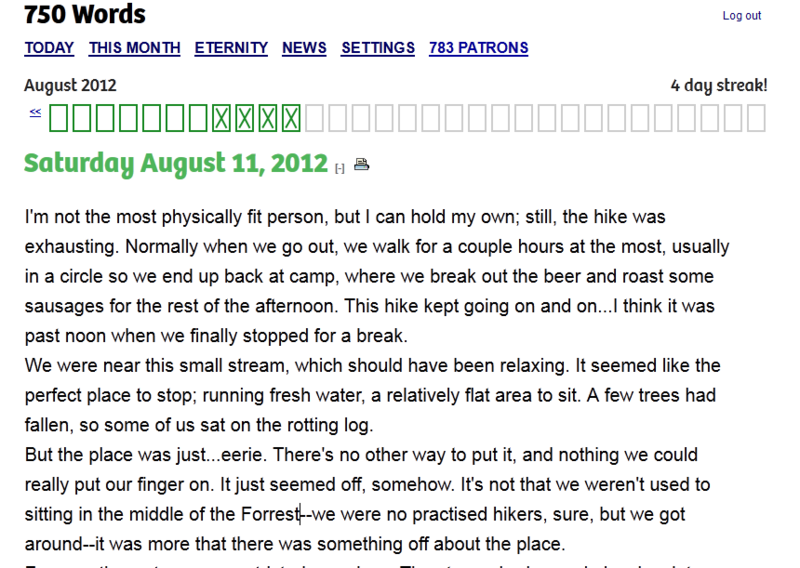 At the top is your “streak.” The number of words is tracked on the bottom of the page. So you’re a writer, and you want to get published. It’s a big scary process, but it’s getting easier–especially with the advent of e-publishing. But before you polish off your manuscript and start selling, you have to write it. This week I’ll introduce some tools that I’ve found helpful in my own process, and I hope you’ll find some use out of them too. The first–and absolutely the most important–thing you need to do as a writer is just sit down and write. I put my writing on hold for many years because I kept telling myself I didn’t have time, was out of ideas, didn’t want to go through the editing process…I was good at making excuses. There’s always a distraction, and it’s indisputably easier to not write than it is to produce something. The tone of your entry. everything perfect, but it’s a start–and once you get into the habit, it gets a lot easier to keep doing it. That’s where today’s tool come in. 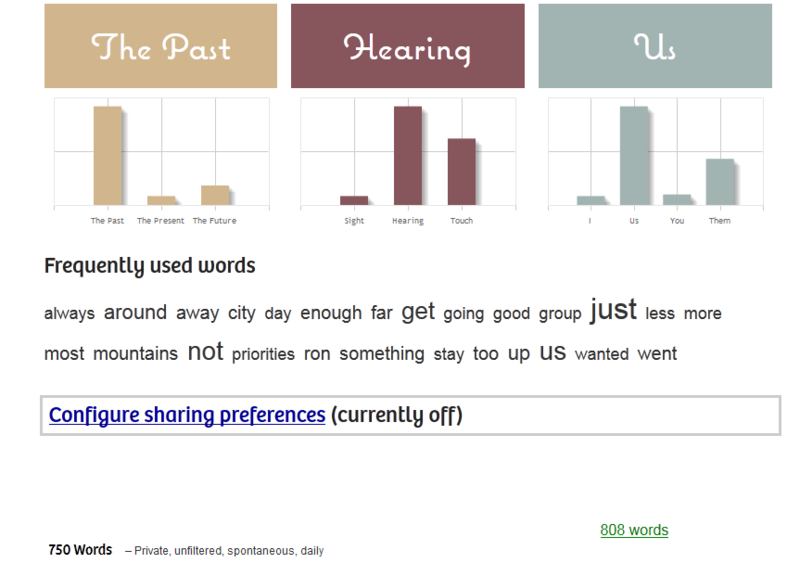 750 Words is a website that encourages you to write (you guessed it) 750 words each and every day. It’s the equivalent of three pages of writing, and only takes about fifteen minutes to half an hour, depending on how fast or distracted you are. It’s the brainchild of Buster Benson, who said he got the idea from a book called The Artist’s Way, in which the above idea–writing three pages a day–is outlined. It’s a simple concept, but I can attest that it’s a powerful one. In my first two days on the site, I bashed out half a short story that’s been knocking around in my head for weeks, not knowing how to be written. Between the two days, it took 35 minutes. Now, of course, this is raw unedited text, but that’s the point: just getting it out as a means of inspiring your creativity. is, and it can reveal some surprising results. It tracks how fast you type, of course, and how long it took you to get to 750 words (word count is tracked in real time); but it also tracks your distractions, compiles a graph showing your words per minute over time, and shows the total words you’ve typed over your lifetime on the site. 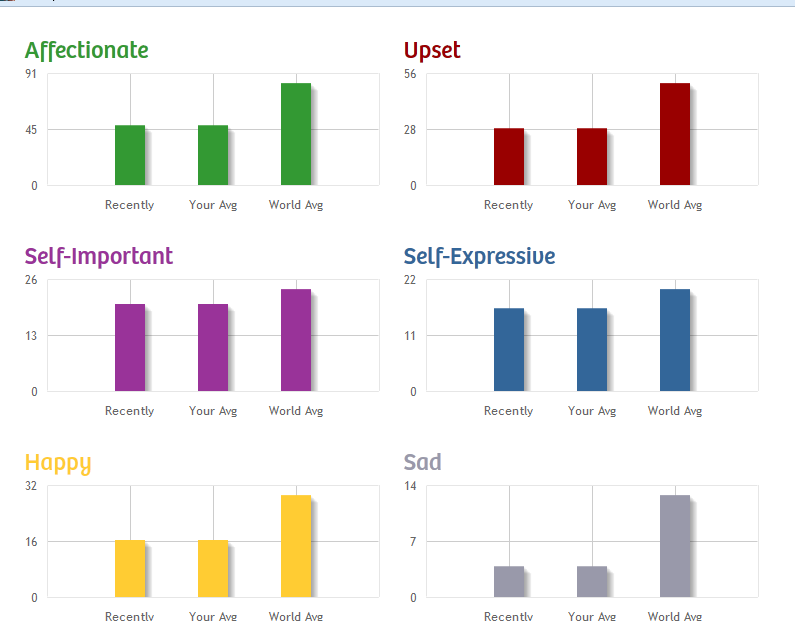 Benson also uses some clever algorithms to track things like the mood and tone of your writing (by picking up on keywords), frequency of word usage (like um, adverbs, and quantifiers), and what tense (past, present, future) you’re writing in. 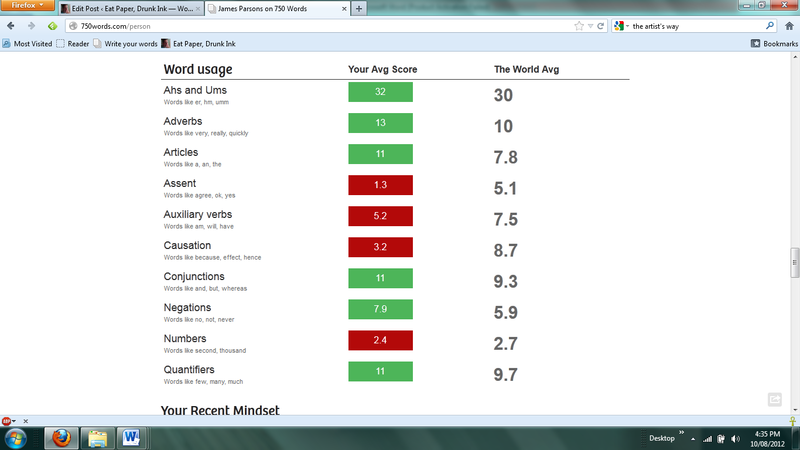 You can check your results daily and see how they change over time, and compare them to how the world (i.e. the 750words community at large) does the same things. This might seem like just some fun information, but for a writer, this kind of data can be invaluable. Do you use certain words too much in your writing? Are you mixing tenses accidentally? Are you trying to write a story one way, but the tone comes out all wrong? Depending on what you write each day and how you interpret the data, you can get a pretty clear idea of how you write–from an objective viewpoint. Tenses and commonly used words. system by means of rewarding your contribution. This is then compared against the world as well, offering an air of competitiveness that some will find motivating. I should note again that this site isn’t meant to be a place where you churn out excellent work. It’s going to be rough-but rough work can be edited. 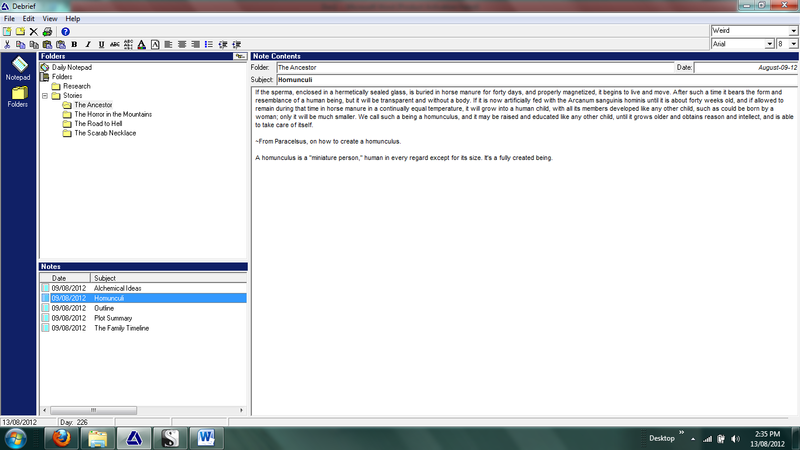 I’ve taken to copying all the text I type once I finish, and pasting it into a raw word file. This way I can go back to it (the site doesn’t save your text day to day) and get a finished story out of it, or even just revisit the writing. Or paste it into Scrivener for some organizing–but we’ll get to that tool later this week. Benson runs this site out of his own pocket, and doesn’t charge for you to become a member. You can, however, donate to the cause by going here and scrolling down. On the left there’s a drop down menu where you can choose how much to contribute via PayPal–cleverly referred to as buying a cup of coffee–or you can contribute monthly. It’s certainly worth it to keep this service free for all. In the end, what we have here is a tool to get you started. Even accomplished writers will find this useful, if anything as a motivator to keep at it daily. The more you write, the better you’ll write, and this is a simple and effective way to get into the habit. Definitely check it out. I’ve done a lot of thinking over the past few days since I started this blog about how often I’ll be posting. Some blogs post daily, some once in a while. I haven’t posted in my other blog–Anything But Falafels–in a while, but am totally getting to it. For this one…I think it’s important to post regularly in an effort to develop my audience–and to keep myself accountable and motivated. So I’m going to try to post daily, even if it’s something quick. Like today. When eBooks first became a thing, I thought it was a ridiculous idea. I’m one of those guys who loves spending time in bookstores and libraries. Ask my wife; we go in, I won’t come out for hours. I love the smell of books, I love the way books feel, I love the heft of them in my hands. For probably close to two decades, I haven’t left the house without a book. So my first thought–shared by many, I’m sure–about eBooks was “why on earth would you want to carry another electronic gizmo in place of an honest to goodness book?” And for years, I stubbornly refused to get into the tech. But it started creeping under my skin. It started with .pdf files and smartphones. I work at a job that requires extensive knowledge of certain laws and policies pertaining to liquor service, and have the Tome itself on a bookshelf in my office. When I heard I could get it on my phone–and search for text, highlight text, and save changes, all on the go–I was intrigued. A phone isn’t an ideal platform for this sort of thing, but it showed me the potential–and it’s a slippery slope from there. A year or so later, I bought my first Kobo, and was an instant convert. I still read “real books,” but the convenience of having them all with me at once is indispensable. You see, I’m a collector of books–between digital and hard copies, probably over 500 and counting. I love to research things, so having a digital library at my fingertips is a great idea. Being able to compare translations of the Tao te Ching or highlight passages in books that give me ideas for stories or other things to research, or making notes within the text to draw comparisons from one text to another; all of this is very exciting to me. Time was I could only do this at the library, having requisitioned a bank of desks to myself, piled to the rafters with books, spending eight or ten hours by myself in a dusty corner. Now it’s all in the palm of my hand. Another thing I love about Kobo is that it’s easy to explore. Browsing is one of my favourite bookstore or library activities; you never know what you’ll find by scouring the racks. Online it’s different; you have to have a place to start, and often you won’t get too much further from where you already are. But algorithms for suggesting new books are improving. With the option to Preview books from the Kobo store, you can even try out dozens of titles for fee and only buy the ones that interest you…kind of like checking them out of the library. The technology isn’t perfect. pdf files don’t display very well on my Kobo. Sometimes the pages don’t turn, or turn more than I intend. The Preview feature is sometimes useless, because the only pages previewed end up being the copyright and Table of Contents. But the technology is growing fast–and so is the base of readers using it, not to mention the huge number of people writing specifically for the eBook market. Which is exactly why I’m here, isn’t it? So what are your experiences and opinions on eBooks? Hurting the publishing industry? The next new fad, only to fade? Wave of the future, one step away from downloading text directly to our brain (how cool will that be)? Next week we’re going to kick off a feature: Writer’s Tools. I’m going to try to post five articles, each featuring a different tool that writers can use to hone their craft. Because, after all, you can’t publish anything if you have nothing to publish. Stay tuned, and have a great weekend!